Who Confederates with Whom in the Horn of Africa? And on Whose Terms? The story unfolding in the Horn of Africa is truly unbelievable. The whole story revolves around Ethiopia’s new, young and relatively inexperienced Prime Minister, Abiy Ahmed. From the moment he assumed office, something akin to The Big Bang Theory erupted in Ethiopia, something sudden, big, powerful, and majestic. Premier Ahmed’s arrival seems to have brokered a mysterious conception and miracle birth of a brand-new universe in a country not known for and spectacularly lacking in the foundational traditions and critical capabilities required to embark on and skillfully manage such monumental transformation. In just eight months, the Abiy phenomenon has convulsed the political land scape in Ethiopia, turned the geopolitical calculus of the Horn of Africa topsy-turvy, and re-set broader international relations. which it moves in giant leaps. 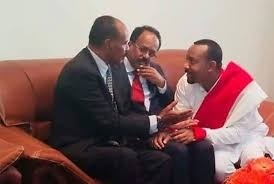 A key element in Project Abiy is the proposed initiative to herd Eritrea, Ethiopia and Somalia into a closer political and economic integration. Although the scheme involves three sovereign countries, PM Ahmed has made it his favorite pet project. He is into this grand project so much so that he comes across as a man in a hurry and on messianic mission. When he returned from his short four-hour visit to Mogadishu early this year, PM Ahmed began talking about Ethiopia and Somalia uniting as one country. And following the meeting concluded in Gondar, Ethiopia, last week, the Prime Minister spoke about a promised future in which Eritrea, Ethiopia and Somalia would become one country with one leader. In attendance were the presidents of Eritrea and Somalia. Neither was in any rush to openly second PM Ahmed’s winged proposition. Of course the adult in the room is resident Afewerki, a veteran politician and shrewd strategist with vast and first-hand knowledge about the troubled history of and latest developments in the Horn of Africa region. He seems to keep all his strategic cards close to his heart. The excitement, energy, and optimism powering PM Ahmed’s juggernaut know no bounds. This has led to a plethora of initiatives aimed at quickly translating PM Ahmed’s imagined political dispensation into a possible and actionable governance framework. In 2002 the University of South Florida (USF) at Tampa hosted an International Conference on Prospects of a Horn of Africa Confederation: Integrating Our Common Future. Soon we may see similar events organized in many parts of the world. However, serious questions are being asked about this grand project. Who confederates with whom and on what terms? Three countries have been handpicked as partners and founding states in the proposed confederation. It is not clear why Djibouti has been excluded. The three countries share borders with Djibouti, and geographically it forms a strategic hub that connects all the countries. Which model of confederation will be adopted? What governance structures, executive, legislative and judiciary, will be established? How will such key and contested issues as president, capital, official language(s), currency be determined? Will the populations of the three states have a say, like referendum, in the proposed confederation? What will be the time frame of this grand project? Finally, is the proposed confederacy owned and led by the three countries or are there other actors who move the levers of power behind the scenes as partners, sponsors or patrons? has juridical sovereignty over territory, population and strategic assets it cannot control and protect. Somalia’s institutions are fragile and extremely vulnerable to infiltration or complete capture by internal criminal networks and/or external predators. reforms across the Horn. However, centuries of hostility and deep-seated mistrust cannot be healed over night. The two-decades long reign of terror unleashed by the TPLF/EPRDF regime on the Somalis in the Ogaden still provokes anger and resentment among millions in the Somali Peninsula. The jury is out as to what will become of this grand project. Given the history of the region and the complex and messy situation prevailing in Somalia, it would be difficult to see how the proposed three-state confederacy could be successfully and sustainably implemented. It is quite possible that a secret mission to pacify and take over Somalia through massive military and administrative occupation is on the cards. But what could such risky scheme lead to is not entirely clear. The likelihood of such intervention producing a positive outcome is zero. In fact a more plausible assessment is that it would trigger a new round of insurgency wars that could make the relentless and destructive attacks by Al-Shabab look like small skirmishes. A better and safer option for PM Abiy Ahmed would be to start with a two-state confederation involving Eritrea and Ethiopia. Somalia and hopefully Djibouti could be invited to join later.